As you might imagine, the Ocean State is not wanting for seafood. Its 384 miles of coastline makes for some mighty good saltwater and freshwater eats and plenty of raw bars to display it all. And you can’t have a raw bar without talking about oysters, many of which are farmed right here in-state. So, grab your seafood bib and your appetite as we shuck our way through the top 10 places for oysters in Rhode Island! This spot is a favorite go-to destination for fresh, locally grown, farm-raised, and wild-caught seafood. The raw bar here is all but famous in the local area, and the oysters are farmed onsite in Potter’s Pond. Moreover, the seafood is prepared simply, and the menu features dishes like local raw oysters, clams, king crab, stuffed lobster, Atlantic salmon, Jambalaya, and tuna tartare. This College Hill mainstay has been offering upscale seafood eats for over three decades, including locally sourced seafood, a raw bar, and relaxing riverside views. Their signature Shellfish Platter is a seafood treat and features six raw oysters, jumbo peeled shrimp, and a whole steamed lobster. Plus, you’ll find other classics like pan seared lemon flounder and a seafood casserole with shrimp, scallops, cod, and lobster in a crispy cracker crust. Self-proclaimed as the largest raw oyster bar in town, Midtown Oyster Bar offers surf 'n' turf dining and an extensive raw bar inside a vaulted-ceiling space with two large decks. Opened in 2013, this raw bar became known for its oyster shooters and its Tuna Tartare Tacos. Plus, you will find octopus, calamari, and even swordfish on the menu. One of the largest waterfront restaurants in Rhode Island, George’s seats almost 500 people at capacity and is locally considered as a seafood landmark, having been established in 1948 as a fresh-catch eatery. Overlooking Block Island Sound and the Port of Galilee, this seafood spot continues to feature fresh local ingredients and award-winning dining options like lobster, a raw oyster bar, chowder, clam cakes, and sushi. Fresh, fast, and minutes from the ocean, this local seafood market and grill offers local oysters and seafood dishes. Food is served in an airy bayside spot that features a marble bar and an ocean-facing deck, and oysters here are always hand-shucked and locally farmed. Moreover, locals rave about the fresh clams and mussels, the chowder, and the salty-sweet lobster rolls. Opened in 2010 inside of a converted river wheelhouse, the Riverside Restaurant offers seafood and vegetarian options with a modern twist. A large part of their menu also boasts gluten-free and vegan dishes, and you will always find two lit fireplaces and an extensive wine list to go along with your meal. However, many folks come for the raw bar with its rotating roster of fresh local oysters, clams, shrimp, mussels, and more. Established in 2007, Benjamin’s offers three levels of dining pleasure, a renowned raw bar, and stunning views of Newport Harbor. The menu combines fresh, local seafood with more terrestrial offerings like prime rib and filet mignon. Plus, dinner is served until midnight, and you will find dishes like shrimp scampi, baked stuffed lobster, lobster rolls, and fish & chips. Featuring $1 oyster night every Mon., Bywater’s menu is chock-full of craft beers, natural wines, comfort food, the local catch, and produce from small regional farmers. Established in 2015, Bywater knew what it was about straightaway, and it wasn’t going to be your typical seafood spot, featuring high-calorie, high-fat seafood dishes. Instead, Bywater offers a raw bar and other seafood plates that are simply prepared, light, healthy, and delicious. 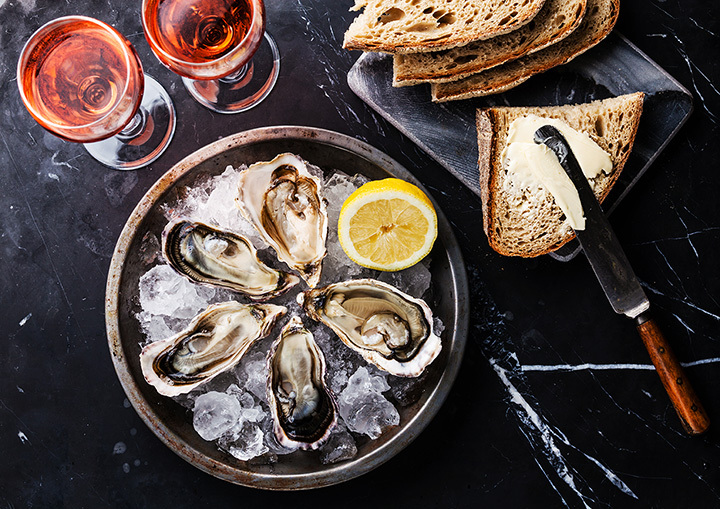 Featuring raw and cooked shellfish and other seafood dishes, the Providence Oyster Bar is one of the most happening places for oysters and a drink in the entire state. Locals talk about the New England clam chowder, the lobster bisque, and the fried oysters, and, plus, you will find a reduced price Appy Hour Menu that offers small dishes that are perfect for sharing with friends. Overlooking Narragansett Bay, this casual, award-winning restaurant features seasonal gourmet seafood dishes in the European style, and you will also find an extensive wine list to complement every meal. Plus, each plate on the menu has been described as a work of art, and you will find gourmet pizzas, a fresh, rotating raw bar, Lobster risotto, and soft-shell crab, among other offerings.